Jessica Graf and Cody Nickson get engaged after 'Big Brother' and 'The Amazing Race' adventures! Jessica Graf and Cody Nickson have made a commitment to marry each other. Cody, a former Marine, proposed marriage to his The Amazing Race partner and Big Brother girlfriend, Jessica Graf, one day before Valentine's Day 2018. 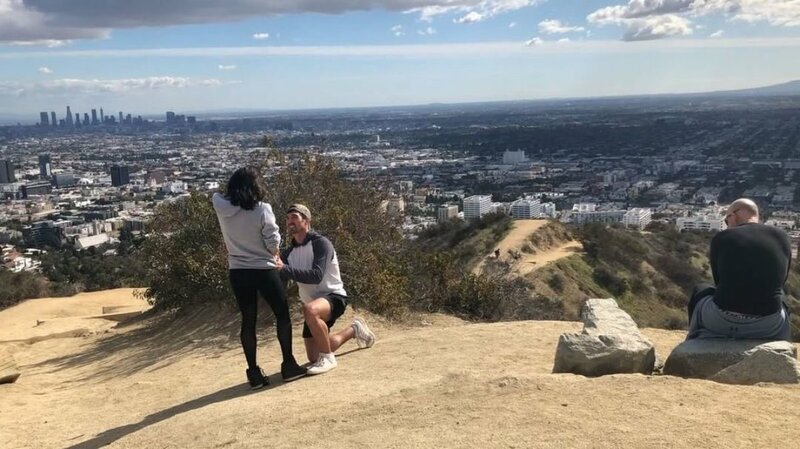 The reality TV couple announced the big news on social media after hiking up Runyon Canyon in Los Angeles, where Cody got down on one knee at the top of the hill. "I said yes! On Tuesday, February 13th my best friend asked me to marry him. He's made my dreams come true every day since we met!" Jessica captioned an Instagram video of the proposal. "I love you + there's no one else in the world for me. You're my person and I thank God for you coming into my life!" In the video, Cody can be heard on bended knee telling Jessica that he wants to spend the rest of his life with her and there was never a question about it. After putting a stunning pear-shaped diamond ring on her finger, Jessica cried and jumped into Cody's arms as witnesses cheered and clapped for the happy couple. "We were trying to keep it under wraps until we could tell our families but you guys beat us to it! Lol," Jessica continued in her post, referencing how the media leaked the news of her engagement. "Thank you to Joey Hamra from Hamra Diamonds for helping my FIANCE design my dream ring!! I'm a happy happy girl!" Cody had also shared a video of himself walking to meet Jessica at the top of the canyon for his proposal. As he was running ahead of Jessica to plant himself in the perfect spot, he told the cameras that she had "no idea" it was coming. "I found my true love, I got the ring, only one thing left to do.............." Cody captioned the video on Instagram. "Thank the Lord, thank you to everyone who prayed for us, thank you BB for casting us so we could meet, thank you Joey Hamra @hamradiamonds in NYC for helping me design the perfect ring, thank you Lori for helping keeping it a secret since I'm with Jess every waking moment, thank you to my sisters and mom and dad for making Jess family... we are blessed." Jessica and Cody met and fell in love on Big Brother's 19th season last year. They were inseparable and surprisingly loyal to each other even when their backs were against the wall, and at the end of the season, Jessica campaigned for fans to vote Cody -- a member of the jury -- as "America's Favorite Houseguest." Her efforts paid off, as Cody walked away with $25,000. In September 2017, the pair joined Season 30 of The Amazing Race. Jessica and Cody are one of four teams remaining on the Race, and viewers will find out whether they won the $1 million on the February 21 finale on CBS. 'The Bachelor Winter Games' spoilers: Who got engaged on 'World Tells All' reunion special?